I love puzzles, though I'm better at word puzzles than visual ones. However, I adore the I Spy books for kids, and when I saw the Little Things app, that's what it reminded me of. Basically, you need to find stipulated little things in a whole screen full of little things. 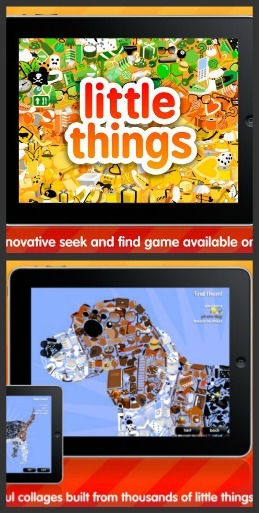 All the family can enjoy Little Things, the innovative seek and find game. Search colorful collages built from thousands of little things. Randomized searches ensure a different game each time you play. *The puzzles are of varying difficulty. Sometimes, it seems, the objects jump out at you and your time is respectable. Other times, not so much. Sometimes, you need to find seven of the same object, but next turn you must find six different objects. That was definitely tricky for me. While I could skim the screen chanting "seahorse, seahorse, seahorse" in my head, it was much harder to chant "dynamite, tomato, screw, ladder, chicken, bat" and find anything at all. *I like the way the fiendish developer has grouped different colours inside the picture puzzle and chosen objects that aren't obvious to find. Well, not to me. Toddlers will probably do it blindfolded. *I also liked the zoom feature. In fact, I couldn't have solved the puzzles without it. *The music is soothing. This is just as well, given my propensity for tearing my hair out when I can't find the last object! *There are LOTS of different puzzles. *Players can ask for a hint. This consists of the field of vision being narrowed so you can hone in on an ever more limited area. Parents of kids with a low patience threshold will value this as much as I did. *As you proceed, you collect jigsaw pieces and they lead to a slightly different puzzle game. *Navigation is simple and intuitive. *This is something the whole family can do. I see grandparents and toddlers sharing the puzzle and siblings co-operating in blissful silence until an object is spotted. Many parents and teachers I've talked to want to find apps that are not only fun, but also educational. 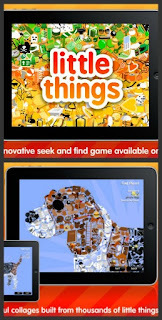 If you're looking for a puzzle game that will intrigue kids, check out Little Things. On iTunes: $2.99 (as of August 9, 2013). The developer, KlickTock, has recently brought out Little Things Forever. The trailer for it, embedded below, will also give you an idea of Little Things, as they are similar. Check out more of my iPad app reviews on Pinterest. If you've enjoyed this post, or any others at The Book Chook, I'd love you to help me spread my literacy, learning and literature ideas by promoting via Twitter, Pinterest, Facebook, StumbleUpon, G+ or any other way you decide. Looks like a fun app Susan. I will surely check it out!